The globalized city is a specific political pole beyond the state, and here its definition is elaborated against the backdrop of Carl Schmitt’s configuration of ‘the Political.’ The chapter points to the ways in which the state has historically de-politicized the city, focusing on the logistical techniques of urban government and production. 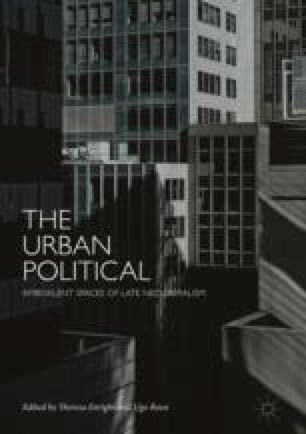 It then argues that the global expansion of the metropolis tends to re-activate the historical character of the city. In contrast to nation-state sovereignty, however, here the political is multiple, unstable and irreducible to any pregiven form. Finally, the chapter proposes a scenario where the world is becoming a unique city, a globalized city shaped by the tension between a planetary logistical urbanization and the emergence of a worldwide stasis. Within these dynamics a new matrix of the Political is emerging.